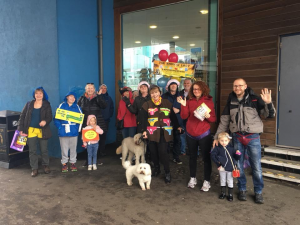 Despite the grey skies and drizzle a lively band of supporters walked from The Pier in Southend to Old Leigh . What a delightful day this always is and by the time we got there it had stopped raining and the sun was desperately trying to shine on us! So then for a deserved drink in the pub or a good Sunday lunch.Thank you all you sweet people who got up early on a Sunday. I am sure you enjoyed our lovely seafront, chatting to interested people along the way and the fact we had raised some money and collected some more KNICKERS. Fab! Soon we hope to build the factory. We are nearly 2 years in. Are you someone who could change the lives of the women and the whole village by donating a lump sum to get THE EMPOWERING WOMEN’S SANITARY TOWEL FACTORY built? Could this be a once in a lifetime humanitarian donation from your family or your business that will be your ongoing legacy?